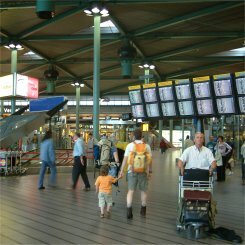 Schiphol Airport in Amsterdam is one of the largest travel hubs in Europe and the easiest way by far to get to the city from over seas. The most common way to get to the airport in Amsterdam from the city center, is by taking a train from Amsterdam Central Station. Airport trains depart every ten to fifteen minutes from platforms 15 and 14a at the northern end of the station. Check the digital screens or ask at information to get the exact time of the next train. Tickets can be bought at any of the machines lining the walls of the station or, if you prefer the personal touch, from the ticket office. Bus lines also operate between Amsterdam and Schiphol Plaza and can be another reliable and cheap way to reach the airport. The Interliner 370 can be caught at Leidesplein while from Amsterdam Zuidoost the Zuidtanger 300 is the bus to catch and from Amsterdam Buitenveldert look for the 310. A taxi trip between the airport and Amsterdam city centre should cost roughly 45 euro. Schiphol offers its own travel taxi service that can be booked at www.schiphol.nl or by calling 0900-8876 (from outside the Netherlands, call +31-38-3394768. 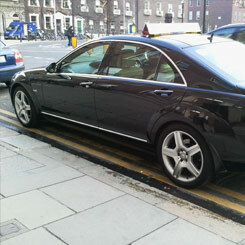 Another reliable option is Taxi Centrale, Amsterdam's largest and most established taxi firm (tel. +31-20-7777777). Those wishing to reach the airport in Amsterdam by car should find Schiphol easy enough to get to. From Amsterdam city centre, head south westerly towards the A10 Ringweg to connect with the A4/E19 freeway, just north of Amsterdamse Bos. Travelling west along the A4 should get you to Schiphol airport in 20 minutes or so, and the route is well sign-posted. Tip! Order your Taxi Transfer online. A fixed price, so you know exactly how much you owe. A quick service, so you don't have to wait for a taxi to show up. The driver will be waiting holding a sign with your name on it. The driver will wait for you even in case of delay. Book your Schiphol Airport Transfer Taxi here. If you've lost some luggage, you can try to reclaim it at the left luggage hall in Schiphol's basement between Arrivals 1 and 2. The desk here is open from 6.00am to 10.45pm and can store luggage for up to a week after it has been misplaced. Illnesses and injuries are the domain of Airport Medical Services at Departures 2, above check-in desk 16. This medical centre is open 24 hours and provides first aid, vaccinations and medical transportation among other things. You can call them at +31-20-6492566. Schiphol has a wireless Internet service for those with their own laptops. It's not free, however, and you will have to either pay online or buy an access code from one of the KPN Internet Zones in the airport. The airport in Amsterdam is one of the few airports in the world to have its own Meditation Centre, an area where the religious of all major faiths can grab a few minutes of quiet contemplation before their flight. Priests are on hand from 9am to 5pm and on Sundays there is an English language Christian service. Look for the Meditation Centre on the upper level of Lounge 2/3, between piers E and F.
All the facilities are depicted on the large Schiphol airport map - click on the link to download (3.2 MB). There are plenty of things to do to pass the time at the airport in Amsterdam. 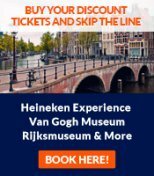 If none of these interest you, it's always good to remember that Schiphol is just a 20 minute train ride from Amsterdam city centre; so don't be afraid to take a trip in if you have a few hours to spare. For those 18 and up with ID, including a boarding pass, Holland Casino offers various games of chance to keep you entertained. Open from 6.30am to 7.30pm, the Casino can be found behind passport control near the E and F gates. The higher-minded amongst us may prefer to spend their time visiting the Rijksmuseum's permanent Schiphol exhibition. Located again behind passport control between the E and F piers, admission is free and the exhibition is open from 7am to 8pm. Those looking for a souvenir will find prints of Rembrant and Vermeer paintings as well as Delft Blue Vases and other curiosities in the museum's gift shop. Shopping is as essential to most airports as aeroplanes, and the airport in Amsterdam is no exception. Schiphol Plaza shops are open from 7am to 10pm every day and can be found before passport control, while the See Buy Fly shops are behind, making them exclusively for passengers. See Buy Fly shops open their doors an hour before the first flight and close half an hour before the last. If you need somewhere to stay, but don't actually want to have to leave Schihpol, the airport in Amsterdam actually has a few hotels behind passport control. Amsterdam Yotel offers economical, 7 square meter rooms for whatever time period you wish, from a few hours to the whole night. The design makes this hotel worth a look and it can be found in the secure transit area close to the departure gates. Hotel Mercure Schiphol is located in Lounge 3 of the airport and has 33 non-smoking rooms available to those with a valid boarding card. The hotel also has free Wi-Fi, its own Nautilus restaurant and the New Destination bar for the use of guests. 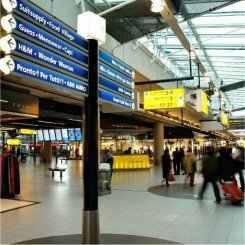 What are the most efficient Amsterdam airport transfers?